Another IHAAZ festival is in the books. And as usual, it was a success. This time it was the AZ Royals who played host. It provided a stage for the Royals to showcase their program, which has come to be known as Royals 2.0. It is essentially a new program from the 8U division all the way up to the 14U division. Nick and Dez Paris head up the program and are proud of what it has become. The couple, along with a handful of other East Valley Phoenix roller hockey enthusiasts, took the reins from the first Royals group and have continued to build it. Not only did the festival feature plenty of competitive and exciting roller hockey games, but the Royals brought in great vendors and food and coffee trucks to make the festival as special of an experience as possible. Nick Paris, who is the president of the AZ Royals Hockey Club, was thrilled with the way the festival played out. The progress of the Royals, along with the progress of teams in other divisions, showed through in the festival in Queen Creek. It was evident that the teams had put in the time in practice since the first festival in order to compete at a higher level this time. In the 8U division, the Tucson Jr. Wildcats proved once again to be the dominant team, although the AZ Royals were competitive at the festival. The Jr. Wildcats are undefeated in the six games they have played. The AZ Royals are 4-4 on the season. 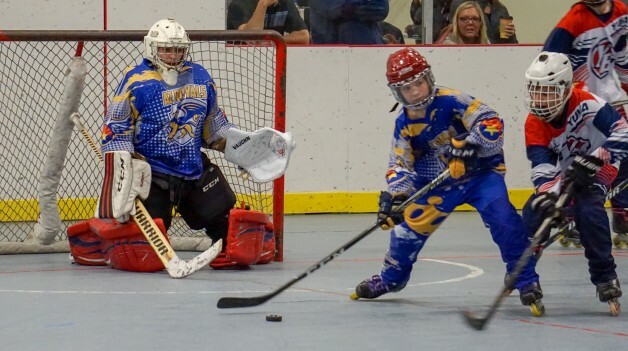 The 10U format featured a championship game that pitted the Prescott Storm against the Knighthawks Blue. The Storm prevailed 6-5 in a tightly-contested game and there is no question the division will be competitive all the way up the state finals. The Storm comes out of the weekend with its record now at 7-0 on the year. The Knighthawks Blue is 5-2 on the season. Seven teams competed in the 12U division. The Jr. Wildcats are 8-0 on the year while the Yuma Blaze is 7-0 on the season. In the 14U Division, the top three teams all went 3-1 at the festival. Yuma is the top team in the division with a 7-1 record. The AZ Royals White reminded everyone why they are the team to beat in the Midget division. They are now unbeaten through seven games and show no signs of slowing down. The Royals Blue and the Northern Arizona Yetis are in the hunt for the division crown as well. AZ Royals White is unbeaten through seven games and has given up just five goals on the season while scoring 47. The AZ Royals Blue is 5-2 and Northern Arizona is 4-1, showing they are alive and well in the battle for the division crown. The next IHAAZ festival is set for Feb. 8-10 at Kennedy Park in Yuma. The venue is unique as its outdoors and the surface will test the dominant teams. Matt DiCori of the Yuma Blaze is looking forward to seeing his program host the next festival. DiCori expects the competition to be at a high level as well. “This group of teams has been playing hard and we hope for tight, competitive games, and the sportsmanship that makes IHAAZ a great place to show off your hockey skills,” he said.